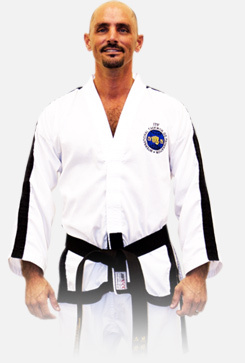 Tae Kwon Do is composed of fundamental movements, patterns, sparring, and self-defense techniques that are so closely related it is impossible to segregate one phase of instruction from another. Fundamental movements are necessary for sparring and patterns, while both sparring and patterns are indispensable for the perfection of fundamental movements. Each fundamental movement, in most cases, represents an attack or defense against a particular target area or defined action. It is necessary to learn as many fundamental movements as possible and fit them into complete proficiency so the student can meet any situation in actual combat with confidence. The pattern actually places the student in a hypothetical situation where he must avail himself to defend, counterattack, and attack motions against several opponents. Through constant practice of these patterns, the attack and defense become a conditioned reflex movement. Power and speed must be developed to such a high degree that only one single blow is needed to stop an opponent, so the student can shift stance and block or attack another opponent. Each pattern is different from the other in order to develop reaction against changing circumstances. 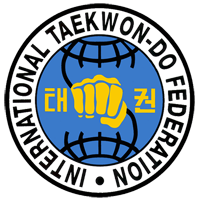 The English name of the organization "International Tae Kwon Do Federation" is inscribed around the globe to signify that the ITF is an international organization and that Tae Kwon Do is a Martial Art practiced worldwide. There is a blue circle and two half circles within it, one on the top and one on the bottom. The top circle represents heaven and the bottom circle represents earth. The blue background symbolizes a righteous and pure spirit to be nurtured by Tae Kwon Do practitioners. In between is the image of a fist with "Tae" and "Kwon" in Korean at either side. A wavy line connects heaven to earth through Tae Kwon Do.